In the city of Weep, a girl falls from the sky. Her hair is the color of cinnamon. Her skin is the color of the sky. The girl is godspawn. She dies when she lands, impaled on the finial of an iron fence. The flock of dream-reading moths that she screams out of her body each night tries to lift her away, but they are too small by far to succeed. Her ghost emerges from the shattered body, perches above her chest, and gazes up at the home that’s forever lost to her. And her love. He is lost to her as well. Far away, in another city called Zosma, a monk dispatches the boy Lazlo Strange to deliver manuscripts to the Great Library. He never returns to the abbey. Instead Lazlo spends years studying arcane papers and writing his own oddly accurate history of the lost city known as Weep. Lazlo is a dreamer, but not the only dreamer in the story, nor is he the nameless orphan the monks believe him to be. One day, the Godslayer—the leader of Weep—arrives in Zosma riding a spectral beast, seeking experts to help rid his city of an unspecified threat. The Godslayer selects Lazlo—who has taught himself to speak the language of Weep from his studies—to be his personal assistant. Lazlo joins other faranji tradesmen, builders, and the queen’s own godson on a six-month journey across a forbidding desert landscape. Laini Taylor’s richly layered story gradually unfolds over the first third of the book. We know that the gods attacked Weep two hundred years ago, enslaving and controlling its people, and compelling its citizens to act as servants and consorts to bear (or to father) their children. After Letha eats their memories, the gods return the people to their homes. Even Weep’s true name seems lost forever. We also learn that 17 years ago, the city finally revolted against the gods in a bitter and costly battle that still haunts the dreams of its survivors. The gods had abused the people terribly and the people were relentless in their quest for revenge. Godslayer Eril-Fane killed the gods and goddesses. He and his followers also slaughtered babies in their nursery—the tiny blue children of mixed blood, all but one born of human females. The Carnage, Minya calls it. She should know. She was there and rescued two infants and two toddlers from certain death. Five survivors, godspawn all. Four girls, one boy, now teens, and each gifted with a special ability by their godly parents. One controls clouds, bringing water to the isolated citadel where they live. Another burns with her own fire, while one gathers human spirits from the city so that she may control them, building up a ghastly ghostly army for the inevitable replay of man vs. gods. And Sarai, born of the goddess of despair and the man, Eril-Fane, sends a hundred moths into the city each night to enter human dreams and invoke nightmares in retribution for the evil humans did to her kind. 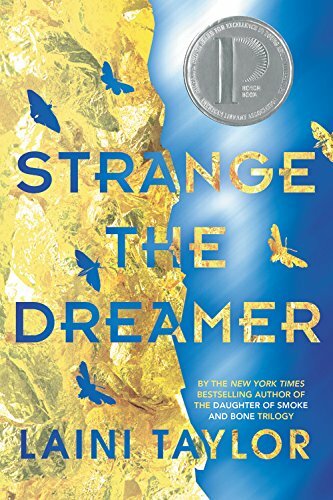 Taylor’s Strange the Dreamer garnered starred reviews and high praise and deservedly so. The language is dark and lush, compelling the reader to finish just one more chapter before putting the book down, only to pick it up again a few moments later. She crafts intriguing, fully realized characters the way an expert artisan crafts fine jewelry. All have their own strengths and flaws; all call out to be recognized for who they are. You’ll want to befriend Lazlo, comfort Eril-Fane, and save Sarai from her fate. Likewise, the world Taylor creates is utterly believable and utterly lovely. Even though we’ve never been to Weep, it invites us to enter, to linger, to enjoy its beauty and complexity. We enter Weep along with Lazlo, Eril-Fane, and other caravan members, winding our way past a gleaming mountain of crystallized demon bones. Once inside Weep, we see immediately the problem that Eril-Fane seeks help with—and so many pieces fall into place.